2009 | Wanna Catch a Movie? A story about relationships, friendships and loneliness, Paper Man is an indie-flick that is maybe trying too hard to be the oddball film of 2009. We meet Richard (Jeff Daniels) and Claire (Lisa Kudrow) at a time of strain and tension in their marriage. With Richard trying to write his second novel but struggling to beat his writers block, Claire suggests he stay in their Long Island beach home for the winter period, while she is off being a super-surgeon. With only his imaginary friend Captain Excellent (Ryan Reynolds), to annoy and taunt him, Richard hires a babysitter – the only weird thing being that it’s for a kid that doesn’t actually exist. Never mind though, home cooking, story telling and genuine bonding see teenager Abby (Emma Stone) finding a new best friend in Richard, resulting in a very unconventional friendship. 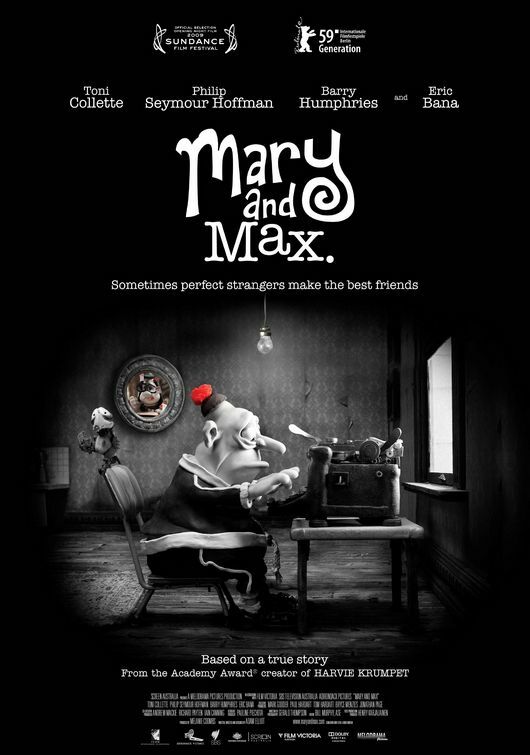 Both the main characters suffer from a sense of isolation and insecurity. Richard is pretty much friendless and Abby has a rough, abusive boyfriend who cares for only himself. This immediately sets an opportunity for some bonding, which is obviously what secures these two as friends. With a fairly plain setting and plot, Paper Man obviously needed to make its mark someway, and what other way than to put Ryan Reynolds in a tight superhero costume with the brightest hair ever. As I mentioned earlier, it’s trying to be the oddball film of the year. Unfortunately it’s a bit hit and miss with this. Reynolds was good, but I feel he was just a bit too stupid. Very dramatic and overly cheesy, I see why this needed to be an element of the film – so ridiculous it’s acceptable – but it was just a bit too much for me. Perhaps an unknown actor in his place would have been better suited. Not saying his performance was bad, just that it didn’t quite fit. The performances in the film were, as a whole, on the good side. Stone’s acting was great, as was Daniels, which was fantastic seeing as they were carrying the film and their relationship was key. A surprising Kieran Culkin also gave what I think was the best supportive performance. Kudrow, although having a small role, gave it a good go though I think she suits funny better. As an independent production, Paper Man is a sweet film that explores companionship – which shows can transcend age if you allow it to. Not quite the successful indie film it was hoping to be, but on its way to becoming just that, debuting directors Kieran and Michele Mulroney certainly have talent that I’m sure we’ll be seeing a lot more of. Directed by Kieran Mulroney and Michele Mulroney. This entry was posted in Film Reviews - P and tagged 2009, 6/10, emma stone, film review, imaginary friend, independent, indie, jeff daniels, lisa kudrow, lonely, paper man, ryan reynolds, superhero on November 12, 2011 by Jen Horsman. When Phil, Stu and Alan take friend Doug (Justin Bartha) on his bachelor party to Las Vegas the night before he’s to get married, they strike trouble when they wake up the next day to find him missing. As they slowly piece back together the events that occurred the night before, they battle through their horrible hangovers to try and find Doug and get him to his wedding on time. What unfolds is a hilarious film, full of great one-liners that most guys love to quote back to you. With a surprising cameo from Mike Tyson too, the film is nothing but entertaining. The Hangover is a very male dominated film and the humour can be seen as fairly sophomoric, just as you’d expect from a typical ‘bro comedy’, yet I myself loved it. The representations within the film are very misguided and stereotypical though, which women may find offensive. Yet if we are to go down that route, even the men have stereotypical roles to fill so I guess there is an equal amount of misguided representation between genders. Besides, it’s not a ground breaking movie with deep messages or profound complexities, but one to make you laugh and full of great scenes that keep you thoroughly entertained. I thought it was fantastically filmed. Las Vegas is made to look enticing and magnetic, the casinos are huge and inviting and the colours from the wider shots of the city pop with a brilliant vibrancy. The three main characters are spot on too. They carry the film at a brisk pace and have great chemistry together. Cooper suits playing Phil to a tee; he’s a slick, good-looking guy with all the talk. He was fairly unknown before this role so it really did put him on the map. He was surprisingly funny and manages to charm the audience each time he’s the focus of a scene. Helms is great a Stu too, in the film he undergoes a transformation from being a whipped boyfriend to an independent man. Helms does this with superb elements of hilarity that make it one of the funniest ‘personal growth’ transformations I’ve ever seen. My favourite character though is Alan who is played by Galifianakis. I’m sure many would agree with this too. Slightly brain-damaged with hints of self-proclaimed Asperger’s, Alan is the “glue that holds them together”. He’s just great. One thing I felt slightly ruined the film for me was the over-exaggeration on Ken Jeong’s behalf, who plays Mr Chow. While his character is a great addition to the film and the personality of Mr Chow had to be played with some degree of exaggeration, in some places I think he goes a little too far. That is my only real complaint about the film, which isn’t much of a complaint at all. I just sat back and really enjoyed the film for what it was. You should too. This entry was posted in Film Reviews - H and tagged 2009, 8.5/10, alan, bradley cooper, casino, ed helms, film review, las vegas, mike tyson, the hangover, Zach Galifianakis on June 11, 2011 by Jen Horsman. The best horror-comedy zombie flick I’ve seen since Shaun of the Dead. Zombieland is a fantastic film that follows four survivors of a zombie apocalypse. They all have plans to move somewhere that doesn’t harbour the undead and where they believe they can live without fear. The film focuses on Columbus (Jesse Eisenberg) on his journey to Ohio to see if his parents have survived the apocalypse. He soon meets Tallahassee (Woody Harrelson) whose only real mission is the find the last twinkies on Earth, and shortly after this, sisters Wichita (Emma Stone) and Little Rock (Abigail Breslin). They choose not to share their real names with each other but instead, use the names of places that can be related to them, this way they won’t get too attached if one should be killed by a zombie. Following a set of rules that Columbus has created, the four travel across America together trying to enjoy the “little things in life”, while avoiding the thousands of roaming zombies. Zombieland has been filmed fantastically. The smooth editing and beautiful wide shots of a ruined and abandoned America give the film a fresh spark, revitalising the seemingly grim and tiresome zombie genre. The ability for the film to point out the usual conventions of the zombie genre through the use of “The Rules” such as, “When in doubt, know your way out” or “Check the back seat” give it a sense of originality too. The only other horror films I have seen do this were within the Scream franchise. The four principal characters are fantastic. With the main focus being upon weedy yet intelligent Columbus, the film shows us a different side to the usual protagonist we would normally see. He obviously knows his horror films and has taken inspiration for his survival from this, one of his rules being “Don’t be the Hero”. Eisenberg is great with this role, though due to his tiny frame and geeky appearance, I feel as though he is starting to be typecast in the role of unlikely protagonist. Wichita (Stone) is a ballsy and brash character, concentrating on fulfilling her younger sisters dreams of going to the “Pacific Playland” amusement park. She doesn’t seem to have made any plans after this, and as the film progresses her vulnerability is slowly revealed. Tallahassee (Harrelson) and Little Rock (Breslin) have a great chemistry together, taking on an almost father daughter bond as the film progresses. There is also fantastic cameo from Bill Murray that had me laughing. 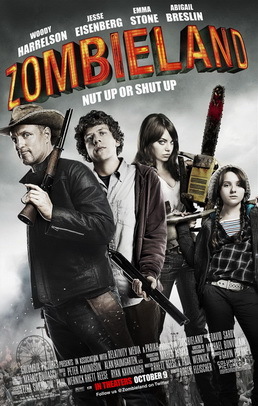 Zombieland is a smart zombie comedy that is original and crisp in its plot, dialogue and cinematography. It points a finger at all the usual conventions that you would normally find in the zombie genre, but is funny and clever with it. This allows it to stand apart from the usual dire consequences people face in zombie flicks, death, and enhance the comical strands that run throughout. The film finishes with an open end, leaving room for a second instalment, and after the success of the first I really hope they act on it! This entry was posted in Film Reviews - Z and tagged 2009, 8.5/10, abigail breslin, apocalypse, emma stone, film review, jesse einsenberg, rules, woody harrelson, zombie, zombieland on June 7, 2011 by Jen Horsman.